Large monogram faux leather tote bag. When an outfit needs the perfect accessory to complete the look, this is the bag of choice! The warm honey compliments blues, greens and oranges and works beautifully with black. The denim works nicely for jeans. This stylish tote sports a stunning faux leather look with contrasting handles, includes a second cross body bag. This tote will be a long lasting and durable companion for day or evening wear, work or leisure. The classic design offers one large compartment with a wide opening on top allowing easy access. For a formal look, carry it by hand using the long handles or sling it over a shoulder for casual appeal. Gold hardware and snap closure on the large tote. Cross body strap and zipper closure for the small bag. NOTE EMBROIDERY WILL ONLY BE INCLUDED ON THE LARGE TOTE. 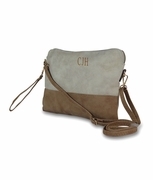 A 1 1/2" accent monogram will be placed near the top of the tote between the handles. Faux leather large tote bag measures 17"W x 16"H. The cross-body over the shoulder bag measures 15"W x13.5"H, inside blue poly-cotton lining, interior wall pocket for cell phone and eyeglasses. Additional inside wall zip pocket. Outside has zippered compartment and closure. Envelope bottom.